In the pre-dawn twilight it was difficult to see the fish, but they were there. Just barely perceptible was a little “slick” that just did not look right. “Get ready” the captain whispered, “they are going to pop up right in front of us”. 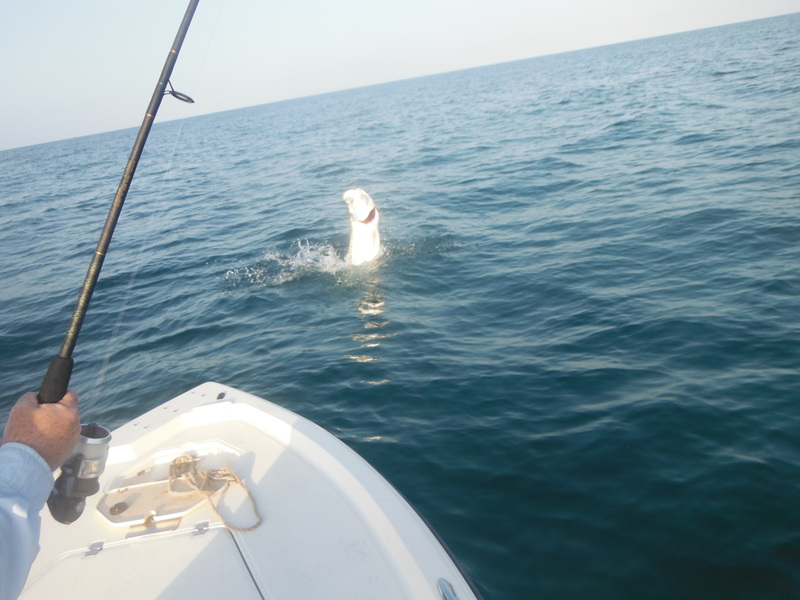 Several anxious moments passed before the flat calm surface of the Gulf of Mexico was broken by the fins and tails of a couple dozen hundred pound tarpon. “Cast out six feet in front of the fish, make sure you don’t throw on top of them,” the guide advised. The crab landed several feet in front of the pod, it was an excellent cast! Both watched in anticipation as the crab slowly sank. After several seconds, the line gradually became taut. “Reel!” the guide hollered, unable to hide his excitement. The angler reeled as fast as he could while raising the rod tip high. The line angled towards the surface as the fish made ready to leave the Gulf. One hundred pounds of silver fury cleared the surface by a good four feet, crashed into the water, ran off on another burst before leaping once again, this time throwing the hook. Disappointment soon turned to admiration; what a fish! That is a commonly played out scenario off of Sarasota beaches from May through July. 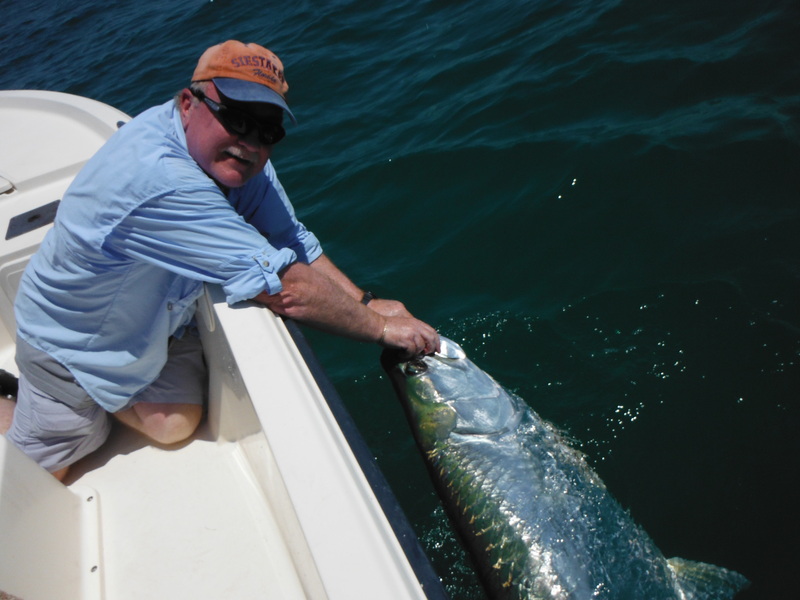 While fishing is very good all year long, there is something magical about tarpon fishing. This is truly world class angling. Very few places on Earth offer the opportunity to sight cast to fish this large using spinning or fly tackle. Many more tarpon are hooked than are actually landed. In fact, most Sarasota guides put more emphasis on stalking and hooking these behemoths than in actually landing them. The old saying, “It is the bite, not the fight” certainly applies. The fish generally show up in early May and are here in significant numbers by the third week in May. Early in the season the schools can be huge, numbering in the hundreds. Later in the season they break up into smaller “pods”. By late July the fish have thinned out considerably, but so has the fishing pressure. Fish late in the year don’t “show” as well but they bite better. The technique is pretty straightforward. Get out on the beach before first light and sit a hundred yards or so from shore. Sit patiently while scanning the surface for fish. Most schools will be moving south but a few will be moving north, especially later in the season. Once a school is sighted, an electric trolling motor is used to position the boat so that it intercepts the fish. The best position would be a long cast up-wind. The baits are cast out in front of the fish and hopefully a hook-up ensues. Anglers in larger boats can catch tarpon, but it is more difficult as they must anticipate where the fish might be and drift in front of them. Heavy spinning tackle spooled with 25-30 pound line is the best choice for most anglers. Although the fish are very large, the baits are light. Conventional outfits can be used to drift baits out behind the boat but are not very practical for casting. The rig is pretty basic; double six feet of the running line using a Spider Hitch or Bimini Twist, then add 3 feet of 80 lb leader using a Double Uni-Knot. Tie on a 5/0 live bait hook and the rig is complete. Both “J” hooks and circle hooks are used. Live blue crabs are by far the preferred bait. CB’s saltwater Outfitters on Siesta Key keeps a good supply on hand. A 3” crab is perfect and is hooked on the outer edges of the “point”. Live bait fish such as pinfish, sardines, cigar minnows, threadfin herring, and blue runners are also productive and can be caught using a Sabiki rig. Fly fishing for tarpon is the ultimate challenge. 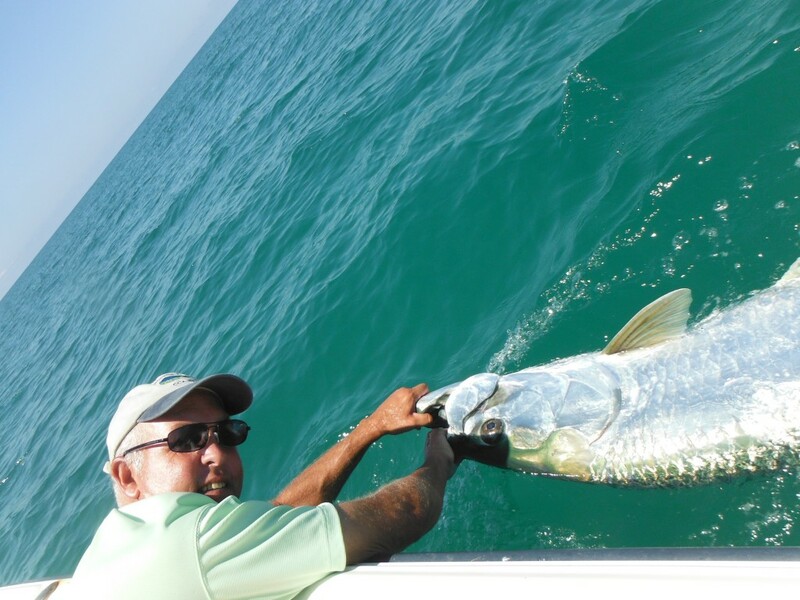 While catching one on a crab is far from easy, landing a giant tarpon on fly is a great accomplishment. A 12 weight rod with and intermediate sink tip is the best choice. Fly selection is really pretty basic; dark flies such as a Cockroach or Black Death have proven to be effective. Many guides have had success with the Puglisi baitfish patters, too. When it comes to fly fishing, it is all about presentation and finding the “right” fish. These would be schools that are moving very slowly and milling near the surface. Patience is required when tarpon fishing. It is very easy to get excited and overly aggressive. The angler who takes the time to get into perfect position will score more often than the impatient one who runs around. A couple words regarding etiquette; do NOT run an outboard near a school of tarpon! It is better to let them go, motor around and reposition than to fire up the “big motor” in a school of fish. Also, if another boat is working a school, leave them to it unless they wave you in. This is especially true in regards to fly fishing, give those guys plenty of room to work. Designed by Website Designer Sarasota - getyourwebon.com.